NH State planners acquired important funding for the purchase of 10 miles of abandoned railway between Hampton and Portsmouth! 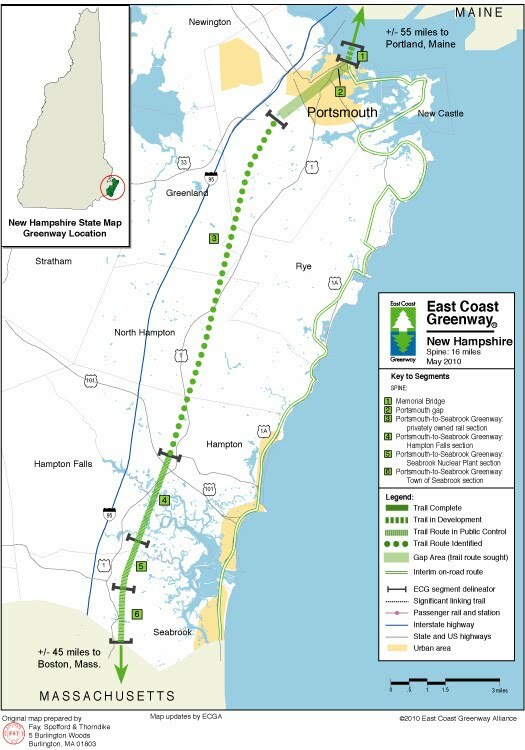 The New Hamphire Seacoast Greenway (NHSG) is a proposed 17 mile non-motorized trail that will connect the eight coastal communities of: Seabrook, Hampton Falls, Hampton, North Hampton, Rye, Greenland, New Castle and Portsmouth. The NHSG is part of the larger East Coast Greenway (ECG), running from Maine to Florida in addition to connecting to the NH coastal towns, the NHSG will connect with segments of the ECG currently being built in Maine, Massachusetts and beyond. three NH state agencies, Rockingham Planning Commission, the East Coast Greenway Alliance, National Park Service Rivers & Trails Conservation Assistance Program, regional and statewide bicycling organizations, and neighboring trail groups in Maine & Massachusetts. The Advisory Committee has a mission to plan, construct, maintain and operate the NH Seacoast Greenway and is currently working to move the project from concept to reality. The New Hampshire section of the East Coast Greenway is the shortest of all states along the Greenway – only 16 miles! It is known as the New Hampshire Seacoast Greenway. Currently, the entire route is on road, but plans are in the works to create an entirely off-road rail-trail from the Massachusetts border to Portsmouth. Bridge. From there, the route hugs closely to the coast for entire trek through the state, offering continuous views of the Atlantic unparalleled in any other ECG state, including of the historic Isles of Shoals. Most of this on-road route has a shoulder, but some sections do not. None of the New Hampshire route is off-road today, but several miles of abandoned railway are pending public control. The NH spine route will total 17.2 miles, and we anticipate virtually all of it will use the corridor of the Boston and Maine Railroad from Seabrook to Portsmouth. This RR ROW crosses into Massachusetts and is being advanced there as a trail. The southernmost portion of this ROW in NH (4.5 miles) was acquired by the State of New Hampshire Department of Transportation when it was abandoned as a rail corridor, including the section passing through the Seabrook Nuclear Power Plant. The northern section (11.5 miles) is owned by Guilford Industries and is still active on a limited basis for rail freight. In Portsmouth, the East Coast Greenway leaves the railroad ROW and uses an on-road route to reach Memorial Bridge where it crosses into Maine. The East Coast Greenway is a developing trail system, spanning nearly 3,000 miles as it winds its way between Canada and Key West, linking 25 cities on the eastern seaboard. Nearly 25 percent of the route is already on safe, traffic-free paths. To form its longer continuous route, the ECG stitches together shorter trails owned and managed by state, county, and municipal agencies. Each local trail retains its identity as an independent facility with a distinct local name. Signs notify users that the trail is part of the ECG. The East Coast Greenway Alliance is the national coordinating organization for the ECG project, a non-profit organization based in Wakefield RI with volunteer committees in each state to spearhead and coordinating this enormous trail-building effort. The Alliance will not own or directly manage any portion of this trail. Rather, it will be owned and managed by municipal, county and state agencies. While the ECGA itself does not build the trails, it promotes the vision for connecting local trails and provides strategic assistance for states, counties and municipalities that do build trail. The ECGA works through national, state, and local partnerships with government agencies, trail organizations,engineering firms, civic organizations, and scores of other groups that support the ECG vision. Through these partnerships and with its own staff and volunteers, the ECGA promotes the trail development and the linking together of local trails across jurisdictional boundaries. The Rockingham Planning Commission (RPC) has served as facilitator for the NH Seacoast Greenway planning effort over the past several years, and provided assistance with conceptual design, strategic plan development, community outreach, projecting demand and return on trail investment, and funding development. This work has been performed by agency staff as well as consulting assistance from Workman Management Consulting. The RPC provides technical assistance to member communities with planning for transportation improvements, land use and development, energy efficiency, natural resource management and economic development. The RPC also serves as the federally-designated Metropolitan Planning Organization (MPO) for 27 communities extending from the Seacoast to the I-93 corridor. Through its member communities and state and local member agencies, the MPO oversees planning and programming of federally funded transportation projects in the region. Make cycling part of your life! Seacoast Area Bicycle Routes (SABR) is a non-profit organization working to promote development of bicycle routes in the New Hampshire-Maine Seacoast area, and promote safe cycling and sharing of the road by all users. SABR has provided matching funding to access federal transportation planning funds for the NHSG project, and served as the non-profit organizational umbrella for private grants and fund-raising supporting NHSG implementation. The Seabrook Conservation Commission supports the creation of a recreational trail along the B&M/Eastern Rail Corridor that bisects Seabrook. The current trail is rutted in some areas and some sections have considerable erosion problems. The run-off has contributed to our need to dredge the ponds adjacent to the railway. There is an stone arched culvert of historic importance and eligible for the National Register. Much vandalism has been done to the culvert, and if it is not stabilized soon, could deteriorate much more. The town owns a 1.5 acre parcel of land that abuts Cain's Mill Pond and a park is planned for that area. It is our recommendation that the first section of the corridor to be worked on should be the section between Railroad Ave and the Library. The Senior Housing complex is located on Railroad Ave. a short distance from the railway. Improving the trail in this area would provide the seniors, and other users, a scenic connection between their residences and the library, plus easy walking access to shopping centers. development of the NHSG conceptual design, strategic plan, and outreach materials; as well as grant-writing, planning for long term organizational structure and management of the trail, and forging community partnerships.